The real estate game is constantly evolving – are you evolving with it? Today, 90% of home buyers are searching the Internet to find the home of their dreams. So if you don’t have a digital presence as an agent, you’re missing out on a large and growing demographic. Don’t get left behind! Join Search Realty today and start taking advantage of the Google Search Network to boost lead capture and win more business online! Search Realty Agents Get Seen First! When you join Search, you’ll get the tools you need to develop an engaging online presence with proven techniques, like geo-targeting and optimized keywords through Google. Being the most widely used search network today, these methods allow Search Realty agents to gain greater exposure across the web and generate hyper-focused leads to target a specific buyer – one that’s likely interested in the area or building that you’re listing. We also place each ad in the ‘paid search results’ section of Google which appears at the top of the Google Search page. That means your ad will be the first one that potential clients see, driving more leads your way! Curious how Google fares up against Realtor.ca? 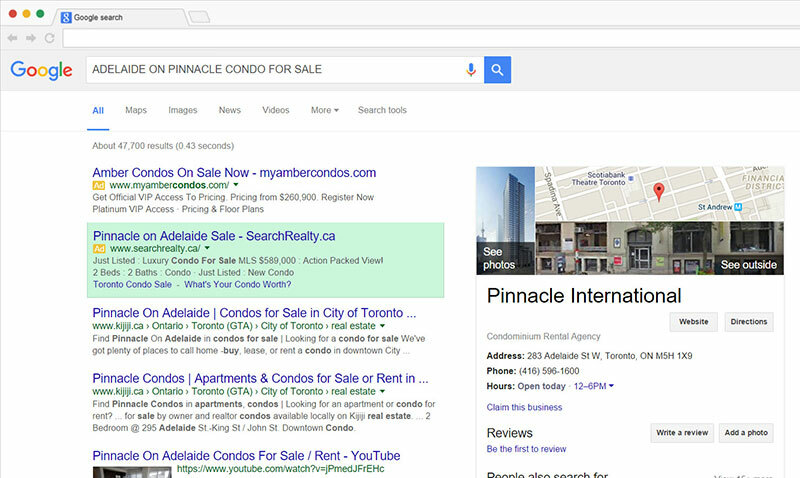 Our team at Search Realty implemented a test for this exact purpose by placing ads on both the Google Search Network vs. Realtor.ca. The results were shocking! 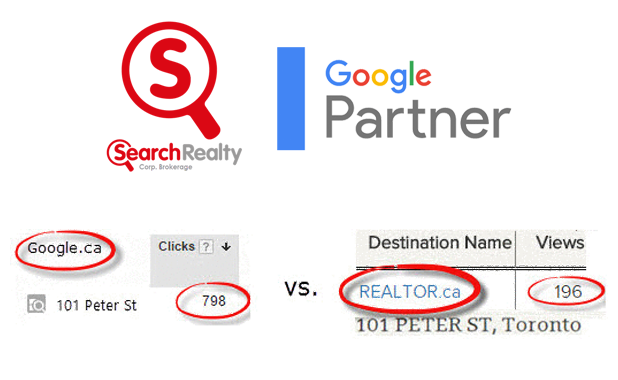 The test showed that Google produced 7x more clicks than Realtor.ca. This alone demonstrates just how powerful and effective Google-based strategies, like Adwords, are for our agents’ success. Don’t waste your time and money advertising to people who aren’t interested in your services. Through tailored listing ads that target specific markets, property types, and locations, Search Realty positions agents for success. How? In this case study, we used a combination of geo-location targeting and keyword tuning to hone in on any prospective buyers within a 1KM radius who displayed interest in finding a unit within a particular location. This allows Search to generate buyer leads, seller leads, and to double-end the transaction. See How Search Realty Uses The Google Display Network.